If you’re like most people, window cleaning isn’t a task you’re itching to do. If you’re one of the few who likes to “DIY”, here’s what you need to know before you get started. For a basic window cleaning job, you’ll need a high-quality squeegee, a good-sized sponge, a microfiber (or other lint free) cloth, a chamois cloth, a ladder and extension tools if you’re dealing with high windows, and a cleaning solution of some sort. Vinegar and water (50/50) is a good solution, or you can buy a ready-made product. With window glass is really grimy, prewash it with soapy water. Clean dirty window frames before you clean the windows. Vacuum the aluminum window frame and door runners and polish them up using a silicone car polish. You can also use the polish in frame channels to help the windows slide easily. Wash vinyl or painted frames with a warm, damp sponge and a bit of detergent. Follow by rinsing with clean, warm water and towel dry. Clean the windows from the top to bottom using a lightly dampened sponge to apply the window cleaning solution. Next, wipe across the window using the squeegee blade (dampened), followed by rinsing the windows using clean water and a chamois. Wipe away remaining moisture with the dry microfiber cloth. If you want streak free windows, clean them on a cloudy day or when they’re in the shade. Why? Because direct sunlight will cause streaking. Sunlight can also cause the cleaning solution evaporate before you finish cleaning. If your house has a lot of windows, divide up the window cleaning job instead of attempting to clean them all in one day. 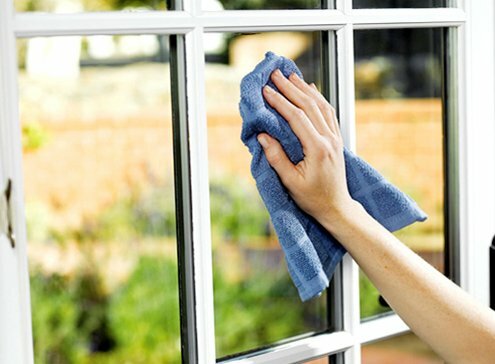 You can easily stain some windows if you are using the wrong cleaner. For example, window cleaning products that contain ammonia can cause film or streaks on windows. It’s also important to note that if you don’t know what you’re doing; window cleaning is a safety hazard that you are better off avoiding. Unless you simply prefer to do household tasks like cleaning windows yourself, keep in mind that professional window cleaning will always be more effective than doing it yourself. Not only can professionals find problems you may not notice, they have the skills to ensure the job is done right, risk free. It’s also obvious to most home and business owners that professional window cleaning boosts the aesthetic of the property.